Although this blog prefers to focus on the present of Vietnam, its people, its places and all that it offers the visitor... we also think that "Those who forget history are doomed to repeat it", that's why we decided to tell you about the Vietnam War Museum. Actually there are several War Museums spread in different cities of Vietnam. We recommend you to visit Vietnam Military History Museum in Hanoi and Vietnam War Remnants Museum in Ho Chi Minh City. Vietnam Military History Museum in Hanoi is located in one of the corners of Hanoi Ciudatel, specifically on 28 Dien Bien Phu. The entrance fee is 1€ and they are open from Monday to Sunday from 9am to 5pm. The main gate is guarded by two huge cannons, a few meters away, a coffee shop of the group Highlands Coffee and behind it, the flag tower of Hanoi Cidatel. As a piece of advice we will say the backyard where the airplanes and other war machinery are, can be seen from the street Nguyễn Tri Phương, without paying the admission fee. 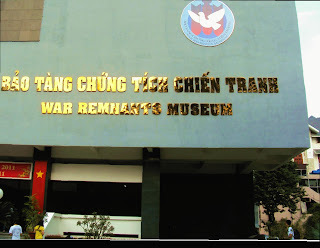 Our next recommendation is Vietnam War Remnants Museum in Ho Chi Minh City. It is located in front of the Reunification Palace of Saigon, on the street 28 Võ Văn Tần. This museum in particular, is very focused on the atrocities and human rights violations committed during the War of Vietnam, especially the effects of Agent Orange in the population (called by the Vietnamese people the orange poison). The photographs displayed in this museum may offend your sensibility and we do not recommend visiting the museum with children. The ticket costs 10.000VND around half dollar (*see Vietnam Currency). The Museum is open daily from 8am to 11:45am and from 1:30pm to 16:45pm.